Urban agriculture is all the rage these days, with community gardens seeming to pop up all over. For good reason: They can turn empty lots into productive spaces, give growers a chance to earn a little cash selling fresh produce, and offer healthful food in areas where it might not otherwise be available. A fruit orchard – what Nina Beth Cardin calls a “food forest” – takes the urban gardening concept to a whole new level. A vegetable patch gives up its bounty for a few weeks or months and can easily be displaced when the land is developed for other uses. Fruit trees, by contrast, require a big commitment in land, time and effort. But the results can be sweet, in more ways than one. Cardin, 60, head of the Baltimore Orchard Project, envisions abundant food forests throughout the city. For years, Cardin tended souls as a rabbi with the Jewish Community Center of Greater Baltimore. Recently, she has added tending trees to her resume. To Cardin, who has five children and five grandchildren, it’s not that big a leap. 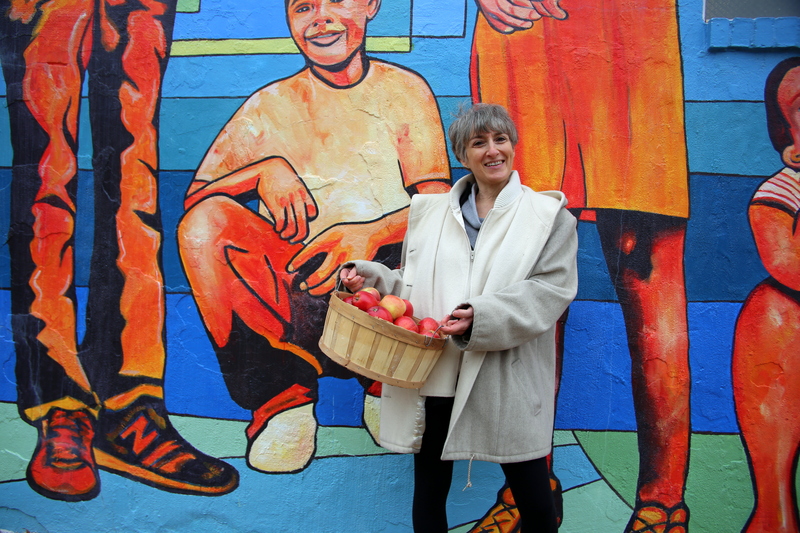 She sees fruit trees cared for by community members as healthy for both the body and the spirit. It’s mainly about making nutritious food freely available to people where they live, she says, “but it also provides a connection to nature on a day-to-day basis.” Eventually, if the project is a success, it could develop into a commercial enterprise where the fruit is sold at local corner stores and farmers’ markets. In a culture of instant gratification, Cardin takes a decidedly long-term approach to social change. It can take five or more years for a fruit tree to become productive. Still, her work is already starting to alter the city’s landscape. Since fall 2012, Baltimore Orchard Project has planted about 250 fruit and nut trees in 21 locations, harvesting and distributing more than 5,000 pounds of fruit. Most of those trees are on private land owned by individuals and congregations, but Cardin is looking to branch out into public spaces like parks and vacant properties.